If you are hired to write a review, you'll want to ensure that your finished document has all the elements necessary to make it a strong, well-spoken commentary. Below are some guidelines to assist you with your critique. First and foremost, don't forget that you're being paid to draw a conclusion. Too many novice reviewers tend to be a little wishy-washy in their pieces. Instead, be bold and strong but not cruel. Nasty reviews tend to have the opposite effect on audiences than was intended, because readers feel sorry for the subject of the review. If you loathed the cheesecake at a restaurant, describe in detail exactly why you found it to be lacking ("the flavour was too subtle; it had virtually no taste") without saying, "This was a piece of garbage that belonged in the rubbish bin, not on my plate." Conversely, if you enjoyed the beginning scenes of a controversial play, go ahead and say so. Remember that you aren't writing your review to make friends; your mission is to fairly inform the public of your experiences, positive or negative. Most reviews mix facts with the basic opinions. Such information could include the running length of a movie or the street address of a bed and breakfast. Without adding factual elements to your critique, it will be short of substance and leave the reader without the opportunity to find out for him- or herself whether you were on the mark or missed it completely. Sometimes, you can spice up a review with a little well-placed humour. In fact, many critics are known for their wit. Depending upon the publication where your review will be printed, humour may or may not be acceptable. You may also have to watch the kind of humour you use; for instance, some editors would frown upon too much childish humour, but would appreciate some "high brow" witticisms. Check with your project supervisor, agent, or editor if you're not sure if your style of humour is appropriate for your review. One of the best parts of writing a review is giving a rating. 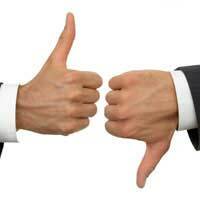 Some authors use stars, others use the "thumbs up/thumbs down" method. If you are able to, develop your own rating system. Be clever; most readers appreciate a little fun. For instance, if you're reviewing your local doggy day cares (yes, they do exist! ), you could use bones or bow-wows, as in: "My co-reviewer and furry friend, Rover, gave Puppy Palace four bow-wows!" Finally, it's appropriate to always give your readers suggestions. If you're reviewing the latest book by Mrs. Jane Smith but you were unmoved by her passages, you might want to suggest that readers go to their local libraries and borrow the book rather than buying it. Or, if Mrs. Smith has written other works, you could say, "This work pales in comparison to Smith's first novella, A Chicken for All Seasons." This encourages the reader to consider looking over a different published piece by the same author. In the end, it's critical that you be critical! Your audience is looking for you to give them some direction, so don't hold back. Just be fair, but be honest, and you'll wind up with a great review.